I first encountered Karen Halvorsen Schreck through her debut novel SING FOR ME. I was swept into a world of jazz and love in Depression-era Chicago. The story is evocative and beautifully wrought, so I was excited when I heard she had another novel, BROKEN GROUND, coming out, and I asked her to join us here on the Deb Ball. Newly married to her childhood sweetheart, twenty-one-year-old Ruth Warren is settling into life in a Depression-era, East Texas oil town. She’s making a home when she learns that her young husband, Charlie, has been killed in an oil rig accident. Ruth is devastated, but then gets a chance for a fresh start: a scholarship from a college in Pasadena, California. Ruth decides to take a risk and travel west, to pursue her one remaining dream to become a teacher. When Ruth spends Christmas with some old family friends, she meets the striking and compelling Thomas Everly, whose own losses and struggles have instilled in him a commitment to social justice, and led him to work with Mexican migrant farmworkers in a camp just east of Los Angeles. With Thomas, Ruth sees another side of town, and another side of current events: the forced mass deportation of people of Mexican heritage, including U.S. citizens, during the repatriation campaign initiated by the Hoover administration. Faced with dramatic new challenges in her own life, Ruth begins to work with the migrant children, and establishes deep friendships with people in the camp. When the camp is raided and the workers and their families’ lives are threatened, Ruth, along with Thomas, must decide exactly what kind of stand they are going to take. BROKEN GROUND is a historical novel about loss, love, and community. But it also reflects on some of today’s most pressing concerns surrounding immigration, deportation, and citizenship. I had a fabulous mentor in high school—an English teacher called “Mr. M.” Looking back now, I’d have to say he was fearless. By this I mean: he wasn’t afraid to assign books that drew complaints from his students’ parents (this was a small, private, conservative, faith-based school) and got him into hot water with the administration. “You’ve got to look at the world outside of your Evangelical shoebox.” That’s what Mr. M always said. And if we students weren’t inclined to do so on our own, he’d help us along. For instance: the spring of my junior he assigned A GOOD MAN IS HARD TO FIND AND OTHER STORIES, by Flannery O’Connor. We didn’t just read one or two of O’Connor’s grotesque, morbidly funny, revelatory stories. We read the WHOLE DAMN COLLECTION. I became steeped in her graphic, gorgeous, apocalyptic world of peacocks and pigs, bible salesmen and BBQs, Confederate soldiers and serial killers. And let me tell you: the book rocked my world. I had never read anything like it—such twists and turns of plot and meaning, characters almost cartoon-like in their rendering, and yet utterly believable to me. I understood something I’d never even thought about before, concerning diversity in North American literature—O’Conner and her fiction were Southern, no bones about it, and if she was that, down to her very last word in every sentence, that meant that there were others out there who were informed by their place of origin, not to mention their race, class, culture, and religion . . . heck, given O’Conner’s painful struggle with lupus, perhaps even their physicality. And she was a woman. She was a woman! Yet she was not afraid to get dirty or be ugly if that’s what her story demanded. After that, I read everything of hers I could get my hands on. To this day, she continues to challenge and amaze me. This past winter, I took a part-time job at the circulation desk in my local public library—the library of my childhood and teenager years, and also the library where I’ve done a lot of my writing in the last decade. I love my new job for lots of reasons. But when I can walk the shelves with a patron and then find the book they were unable to find and put it into their hands, I am most happy indeed. My first thought: oh, I wish I could paint! I wish I was a visual artist and could sublimate all the words rattling around in my head for an image. And that’s true; I wish I had this talent. But you know what I REALLY wish? I wish I was highly organized. I wish I had a dazzling, masterful way with clutter and paperwork, family calendars, closets, and cupboards. I do not have this gift. And if I ever had any affinity for organization at all, it went out the window when I married and became a mother. Sigh. Maybe someday . . .
I’ve been told that I’m a really good listener. A friend once said to me, “When you listen, it’s like you’re responding to me.” It’s an ability I try to draw upon when I’m able. I personally feel deeply grateful to anyone who really takes the time and energy to hear what I’m going to say, so that motivates me to do unto others as I would have it for myself in a perfect world. Of course, I’m anything but perfect. But when I manage to wholeheartedly listen to what someone is saying, particularly my daughter and my son, who are teenagers now, I learn a great deal. Also, it’s an honor to listen, deeply gratifying. No gift can top the gift of life shared. Tell us a secret about the main character in your novel—something that’s not even in your book. Ruth Warren, the main character in my novel BROKEN GROUND, which is set in the 1930s, once painted her fingernails bright red. Once, only, did she paint them—she was fourteen at the time—but that was all it took. Ruth was severely punished by her parents, who spoke, they said, for their entire congregation at the Church of the Holy Redeemed, along with God. At their orders, Ruth scrubbed off the polish with a boar bristle brush and hot water laced with vinegar. It took some time and left her hands raw. She should have known better, she told herself, and she vowed never, ever to do such a thing again. But then in her early twenties and in the wake of great loss, Ruth boarded a train and went to college in California. There she met her roommate, Helen. Hel Mel is her nickname, and she lives up to it—wild and carefree, with a penchant for the finer and frivolous things of life, including fingernail polish and lipstick. Ruth isn’t quite ready yet to paint either her face of her nails. But Helen’s pleasure in such things is rubbing off on her a bit. Someday, she vows, she will buy herself the perfect shade of red fingernail polish and matching lipstick, and she will brandish it like armor, wearing it whenever she wants. The graveyard shift at UPS, unloading boxes from trucks and putting them on a conveyor belt. There was a quota of boxes you had to meet every fifteen minutes. I can’t remember the exact number, but I know that even the more seasoned workers found it challenging. I was just out of college and I wanted to “do something physical.” I was the only woman on the dock. I had to use my body in unfortunate ways to leverage the heavier boxes hither and yon. When a friend saw all my bruises—I was basically a walking bruise—she said, “You’re leaving that job.” When they heat in the trucks got above one hundred degrees (we worked from twelve to six, no breaks), I quit. Now it seems like I dreamed the whole thing. But I didn’t. Just ask my friend. GIVEAWAY: RETWEET on Twitter, and/or SHARE on Facebook by noon (EST) Friday, May 13th to win a copy of BROKEN GROUND (US only). We’ll select and contact the winner on Friday. Good luck! 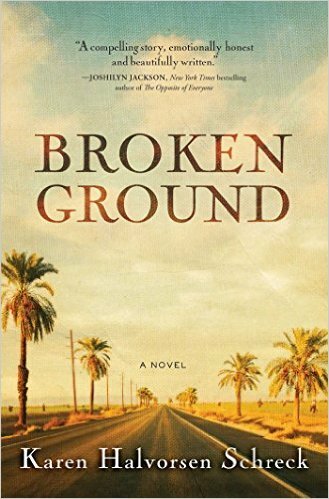 Karen Halvorsen Schreck’s latest novel is BROKEN GROUND (Simon & Schuster’s Howard Books). Her previous novel, SING FOR ME (Spring, 2014) was called “Impressive . . . a well-wrought and edifying page-turner” by Publisher’s Weekly (Starred Review). 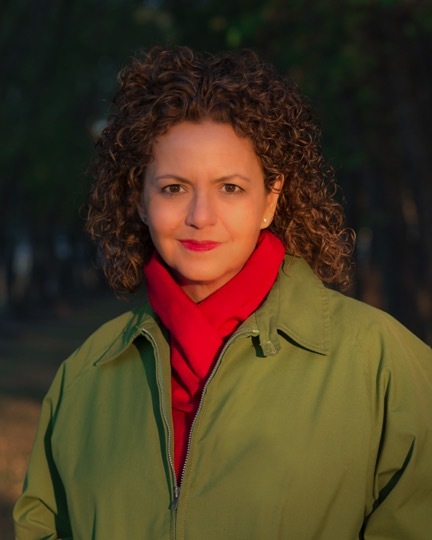 Her other novels include WHILE HE WAS AWAY, a Finalist for the 2012 Oklahoma Young Adult Book Award, and DREAM JOURNAL, a 2006 Young Adult BookSense Pick. Her published short stories and articles have received various awards, including a Pushcart Prize and an Illinois State Arts Council Grant. Karen received her doctorate in English and Creative from the University of Illinois at Chicago. She lives with her family in Illinois. Find Karen on her blog, Goodreads, Facebook, Twitter, and Instagram.